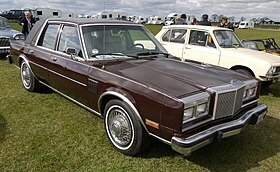 The Chrysler Fifth Avenue was a trim level/option package or model name used by Chrysler for its larger sedans from 1979 to 1993. The Fifth Avenue name was no longer used after 1993 when Chrysler introduced its new LH-platform New Yorker and similar LHS. The title "Fifth Avenue" references a street in New York City in the United States which contains many upscale shops and cultural attractions. 1 Origin and the "R-Body years"
Origin and the "R-Body years"
The Fifth Avenue name was first used in 1979 on an upmarket sub-model of the R-body Chrysler New Yorker sedan. This generation of Chrysler, although already smaller than its maximum size in the mid 1970s, was still V8-powered and rear wheel drive. The R-body rode on a 118.5-inch (3,010 mm) wheelbase, which was still considerably longer than its downsized GM and Ford competitors. For 1979, ordering the New Yorker Fifth Avenue Edition package got the buyer a car finished in two-tone beige with matching leather interior. There was a standard landau vinyl roof, and somewhat unusual opera windows which opened with the rear doors. The package was so thoroughly color-keyed that even the bumper rub strips were beige. The R-body Fifth Avenues ran for three years, although additional Fifth Avenue colors were added for 1980 and 1981. Adding to an already exclusive model, the 1980 and 1981 Fifth Avenues had the option of a special edition version. This special edition model was painted a single tone "Nightwatch Blue" with gold pinstriping with a matching blue Landau roof. Of the 7,356 Fifth Avenues built between 1980 and 1981, only 733 were special editions. Overall production of the R-body New Yorkers was low (less than 75,000 from '79-'81) and the Fifth Avenue production was at most 25% of them. Very few exist today, in any condition. Approximately 14 were stretched into limos and several were provided for use during the 1980 winter Olympics in Lake Placid, NY. The others were loaned to for use by Hollywood movie studios. A few still exist and are in the hands of collectors. In 1980, a Fifth Avenue package was created by ASC (American Sunroof Corporation) for the Chrysler LeBaron, which shared its Chrysler M platform with the Dodge Diplomat. This rare option package, produced on 654 LeBarons for the year, included many of the exterior features found on the New Yorker Fifth Avenue in a smaller, more sensible package. The Fifth Avenue option was still available as a $1,244 option package. It was adapted from the earlier LeBaron's package, with a distinctive vinyl roof, electro-luminescent opera lamps, and a rear fascia adapted from the Dodge Diplomat, albeit modified. Interiors featured button-tufted, pillow-soft seats covered in either "Kimberley velvet" or "Corinthian leather", choices that would continue unchanged throughout the car's run. In addition, the carpet was thicker than that offered in the base New Yorker, Diplomat and Gran Fury/Caravelle Salon, and the interior had more chrome trim. The Fifth Avenue option also included illuminated entry, AM/FM stereo with a rear amplifier, power door locks, power 6-way driver's seat, power antenna, remote trunk release, dual side mirrors, full undercoating, passenger vanity mirror, tape stripes, locking wire wheel covers, as well as a standard 5.2L (318 in³) V8 engine. 1982 was the last year for the optional AM/FM 8-track stereo, and AM/FM stereo with integrated CB. The exterior of a Fifth Avenue Edition New Yorker can be identified from a regular New Yorker by the following: opera lights, hood stripes, and Fifth Avenue Edition badges on the rear door window filler panels—New Yorkers bore "New Yorker" badges. In another confusing name swap, the New Yorker name was now used for another new K-car line in 1983, the E-body New Yorker and Dodge 600. The M-body car was now called New Yorker Fifth Avenue to distinguish it from the E-bodies. 1983 was the last year M-bodies were made in Canada and the last year for the optional "Chronometer" glovebox-mounted clock, the 225 Slant-six six-cylinder engine, and all analog tuned radios and chrome-trimmed pedals. Starting with the 1984 models, Fifth Avenue production was moved from Windsor, Ontario to St. Louis, Missouri. Beginning in late 1986 through the 1989 model year, they were manufactured at the American Motors plant in Kenosha, Wisconsin (purchased by Chrysler in 1987). The Fifth Avenue also far outsold its Dodge Diplomat and Plymouth Gran Fury siblings, with a much greater proportion of sales going to private customers, despite its higher price tag. 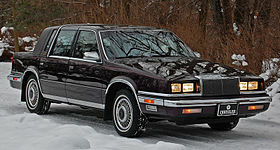 Production peaked at 118,000 cars for 1986 and the Fifth Avenue stood out in a by-now K-car dominated lineup as Chrysler's lone concession to traditional RWD American sedans. 1984 - New Yorker badge replaced by Fifth Avenue badge on trunklid; "Fifth Avenue Edition" badge continues on the rear doors, a new steering wheel was added. The regular Pentastar was replaced by a crystal one and was now used on the hood ornament and steering wheel this would continue through the end. Wiper arms were now black (instead of silver). Engine blocks were also now painted black (previous ones were painted light blue) Optional 10 spoke alloy "Road Wheels" were replaced with new optional "Snowflake" alloy wheels. 1985 - New black gearshift knob introduced (1982 to 1984 models have chromed knobs). Turn signal lever is now also black (1984 and below models were interior color keyed) with the exception of models with two-tone paint. A revised 5.2L V-8 now with a roller camshaft, swirl-port heads, and carburetor change from a Carter 2bbl to a Holley 2bbl increased horsepower from 130 to 140 and torque was also increased to 265 lb-ft (from 230). The interiors were given a make-over with plusher leather seats, headliners, and upgraded door panels featuring larger armrests with the power window switches located on them, as opposed to being on the door panels separately. 1986 - New-style ignition key and center high-mounted stop lamp (the latter a federal mandate) introduced. Models with two-tone paint had lower roof lines. 1987 - New steering wheel; final year for optional alloy wheels, two-tone paint, and rear stereo amplifier were offered. Also the last year for 17-ounce deep-pile carpeting and the last year the radio, headlight switch and climate control panels were silver. 1988 - Vinyl roof restyled; lower edge of sail panel covering extended below chrome window sill moldings. "Fifth Avenue Edition" badge replaced by a crystal Pentastar surrounded by a gold wreath which in 1990 would reappear on the Imperial. Driver's side seat now had a manual recliner (previous models had 6-way power adjusters, but no recliner). Front headrests were more cushioned. The piping around the seats was now stitched material rather than the plastic in previous years. Some radios were replaced with new ones. Door panels are restyled and new power mirrors are standard. Passenger side dash vents were now interior color-keyed (instead of black with chrome trim). A new overhead console with map lamps, compass/temperature display and sunglasses storage became available. A driver's side airbag and padded knee bolster affixed below the instrument panel became optional in May. 1989 - Final year of production. Driver's side airbag is standard. At the time the Fifth Avenue (as well as its M body twins) was one of the only cars that offered an airbag with a tilt steering wheel. In the AMC television show "Better Call Saul", Mike Ehrmantraut drives a black M-body Chrysler Fifth Avenue. During the years 1982-1988 approximately 60 of these cars were stretched into limousines by various coach companies. 1990 saw the previous relationship between New Yorker and Fifth Avenue return, as the Fifth Avenue became a model of the New Yorker. There was some substantive difference, however, as the New Yorker Fifth Avenue used a slightly longer chassis than the standard car. The new New Yorker Fifth Avenue's larger interior volume classified it as a full-size model this time; despite having smaller exterior dimensions than the first generation. 1990 also saw the return of hidden headlamps which when off were concealed behind retractable metal covers. Hidden headlamps had not been available since the 1981 R-body New Yorker Fifth Avenue. For 1990, Chrysler's new 3.3-liter V6 engine was the standard and only choice, teamed with the company's A-604 four-speed electronic automatic transaxle. Beginning in 1991, a larger 3.8-liter V-6 became optional. It delivered the same 147 horsepower as the 3.3, but had more torque. The New Yorker Fifth Avenue's famous seats, long noted for their button-tufted appearance and sofa-like comfort, continued to be offered with the customer's choice of velour or leather, with the former "Corinthian leather" replaced by that of the Mark Cross company. Leather-equipped cars bore the Mark Cross logo on the seats and, externally, on an emblem attached to the brushed aluminum band ahead of the rear door opera windows. In this form, the New Yorker Fifth Avenue resembled the newly revived Chrysler Imperial, although some much-needed distinction was provided between the cars when the New Yorker Fifth Avenue (along with its New Yorker Salon linemate) received restyled, rounded-off front and rear ends for the 1992 model year, while the Imperial continued in its original crisply-lined form. All New Yorker Fifth Avenues of this generation were covered by Chrysler's market-leading "Crystal Key Owner Care Program" which included a 5-year/50,000-mile limited warranty and 7-year/70,000-mile powertrain warranty. A 24-hour toll-free customer service hotline was also provided. The Fifth Avenue name was discontinued at the end of the 1993 model year when the New Yorker was replaced by the redesigned, longer, and more aerodynamic 1994 New Yorker and similar LHS. Wikimedia Commons has media related to Chrysler Fifth Avenue. This page was last edited on 15 March 2019, at 00:36 (UTC).